The iPad is a solid video-playing machine. But you have a whole slew of choices when it comes to finding and watching videos on the new tablet. Which is right for you? Let's explore your options. This is the way Apple would prefer you do things, as it would presumably involve you paying them for the videos you're watching. It's probably the most idiot-proof way of watching TV shows and movies (provided they're in the iTunes Store), but it's also going to fill up your iPad's hard drive really quickly. If you want to load the iPad up with your own ripped or downloaded videos, they'll need to be 720p or less and in h.264. Check out Joel's in-depth post on this very subject for more details on that. This great app is the perfect solution for people who store lots of videos on their computer but want to watch them on their iPhone. And an iPad version is currently awaiting review from Apple. When it's approved, it will probably be the best option for watching downloaded or ripped videos on your iPad without stuffing the hard drive. The official Netflix app is free, although in order to use it you'll need to be a paying Netflix member. It allows you to stream the same shows and movies available online and on the various consoles and devices that already support Netflix streaming. This hasn't officially been announced yet, but the scuttlebutt has it that the Hulu app will be Hulu's first foray into paid subscription services. That means you'll probably have to pay for the right to stream all its content to your iPad, although just how much isn't clear. 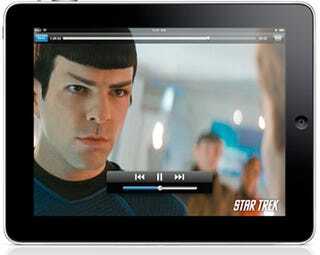 The iPad's built-in YouTube App clearly will let you watch YouTube videos on your tablet. Of course, full TV shows and movies aren't really what YouTube is all about, but for music videos and other standard YouTube fare this is clearly where you'll head. ABC's iPad app will let you stream any of their shows, but unfortunately it's the only network offering iPad streaming up. CBS's TV.com iPhone app will work if you're really desperate for CSI, but it'll be ugly as sin. Hopefully they'll update it for the iPad soon. Vimeo is set to work on the iPad thanks to its conversion to HTML5. Flickr, too. CBS is also currently testing its streaming content in HTML5. And hey, Gizmodo's (and all Gawker sites') own video player is now HTML5-friendly, so those videos will play on the iPad as well. With other sites such as the NY Times, CNN and TED switching to an HTML5 video player, there should be plenty of options for you to view web-based videos inside of Safari.